you really are a dear, what fun you created for Suzanne!! How very sweet of you two! I love the orange, pink, and green cake the best! Go Suzanne!!! Cassie and Betsy, great job on this page — what a celebration for Suzanne! WOW!! !You two are so loving! This is very cool..nicely done. This is sooo cool! The ocean cake is amazing. Happy Birthday, Suzanne. May all your birthday wishes come true. GREAT page, Cassie & Betsy! What a beeyootifool Celebration Page ! Well done Cassie and Betsy. 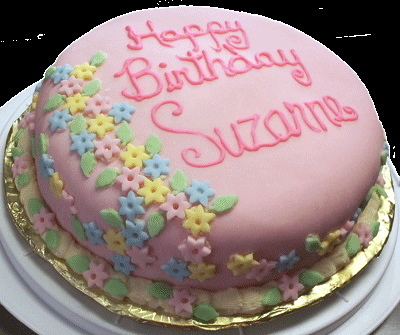 Happy Birthday to the Indispensable Mod, Suzanne. Hugs from a land in springtime. Wow, this is the first time anyone has evah put together a web page to celebrate my birthday. I do not have the words to express how much this means to me – nor how I will treasure the warm memories of this special page created for my special day. Girl knows how to party!